The Dynamics GP Blogster: How to calculate the number of days a vendor check takes to clear? How to calculate the number of days a vendor check takes to clear? I am always amazed at the things you can do with Microsoft Dynamics GP. Just recently, a user pointed out that the Days for Checks to Clear field on the Vendor Credit Summary window was always blank and that they needed this field to update automatically. According to the help file, the field is defined as "View or change the average number of days that a check you issue to the vendor usually takes to clear your bank. ", in other words, you can manually update it if you need to track this data. 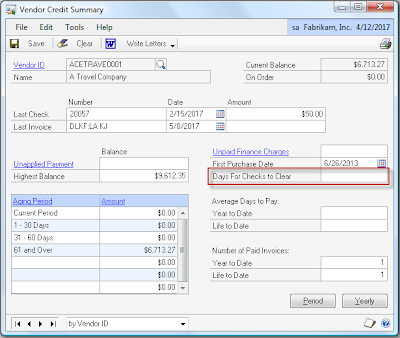 The user also pointed out that they performed daily bank reconciles and that the Cleared Date column in the CM Transaction (dbo.CM20200) table was reflective of the actual check cleared date in the bank and that they would like to use this field to update the Days for Checks to Clear field in the Vendor Credit Summary window. After all, the date value of the Cleared Date column only gets updated when the check is marked as cleared during a checkbook reconciliation process and does not necessarily reflect the actual date the check cleared the bank, but with daily bank reconciles this should not be an issue, because the would be one of the same. Now what to do with the script? You can schedule it as part of a SQL Server job that will run daily to update this value for you! This will allow you to have accurate average days for each vendor and in turn will allow you to make better purchasing decisions to preserve your hard earned cash. Mark Polino noted that the Cleared Date for each transaction can be set by clicking the blue arrow next to Payment or Deposit in Bank Reconciliation.